← New for 2015: Just Born Serves up a Trio of Awesome Halloween Boxes! 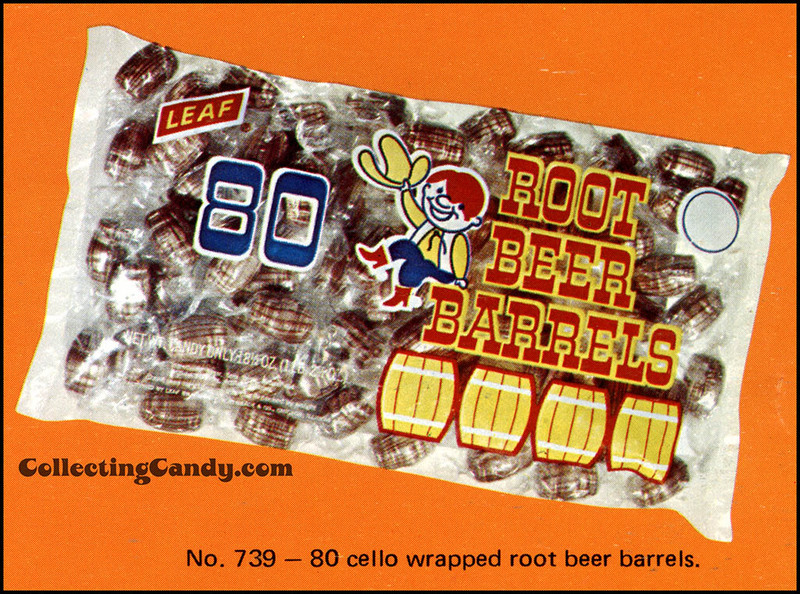 Today I’m pleased to share a wonderful piece of candy history that you won’t see anywhere else. 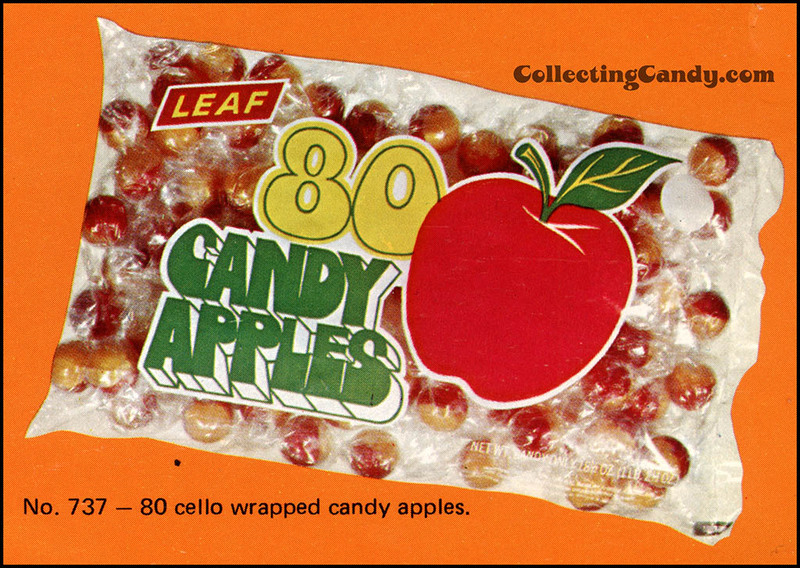 It’s a sales brochure from 1973 that was sent out to candy salesmen to help them sell Leaf brand product to their retail clients. 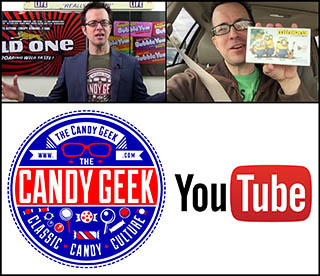 It’s a wonderful array of vintage candy goodness you won’t find anywhere else, so make the jump to check it out. Back in the early 1970’s, before the widespread establishment of powerhouse retailers like Walmart and Target, candy salesmen (or jobbers, as they were often called) would work out of their cars and trucks and have established routes and territories. Those routes would have them regularly visiting their customers which were mom and pop grocery or variety stores. 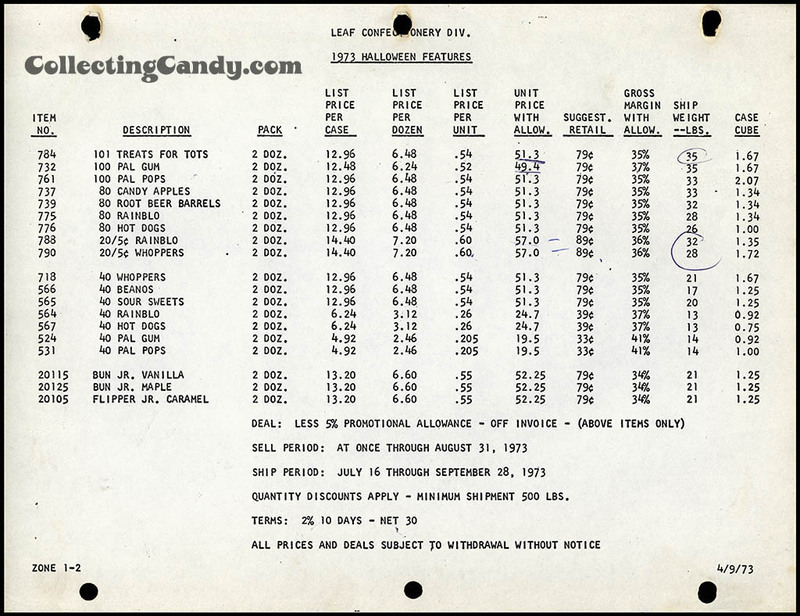 It was a time when confectionery sales was a beat-your-feet kind of job and success was typically distilled through hours or work put in on the route combined with the relationships a salesman had with the people on it. With thousands of salesmen around the country and just as many many small routes and territories to cover, manufacturers were constantly coming up with ways to entice the retailers to buy and the salesmen to sell. 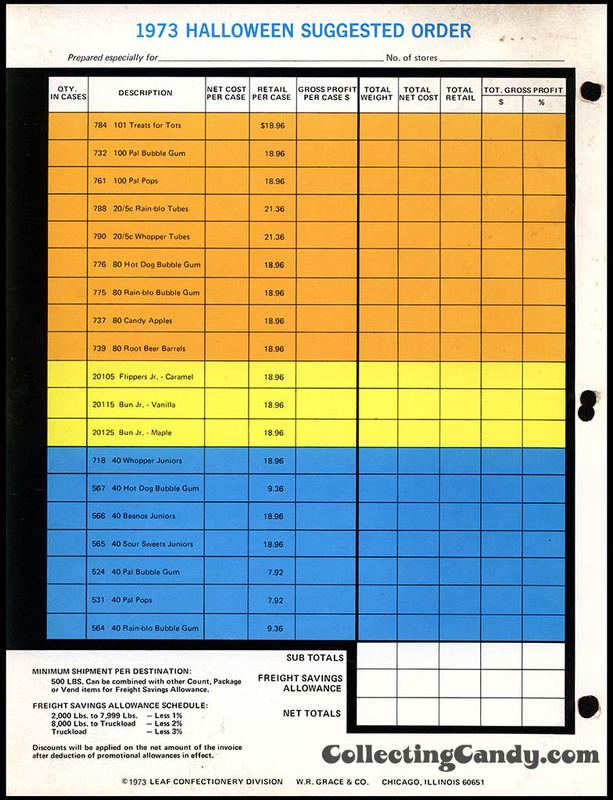 One of the ways they did that was by sending out colorful brochures and flyers, along with special promotions and deals where the retailers could save and the salesmen could make more for themselves. 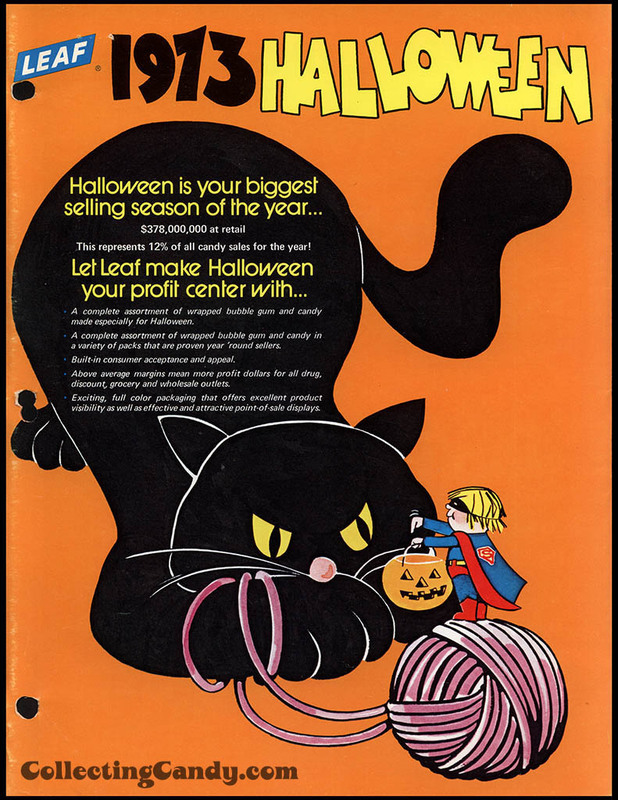 Today’s 1973 Halloween sales brochure from Leaf is a great example of this. Let’s get to it! You’ll notice the illustration of a kid in a completely unlicensed Superman costume. Something like that would never be allowed to happen today, but these were simpler times. This brochure unfolds and opens up into a three page gatefold view of everything that Leaf was promoting for the 1973 Halloween season. 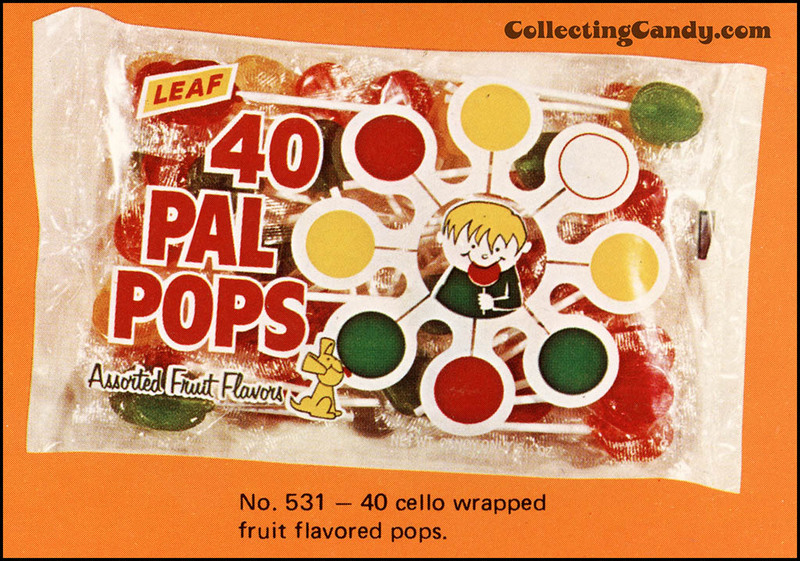 As the brochure proclaims, Leaf’s Halloween offerings included items that were available all-year-round as well as a selection that were only offered during the season. 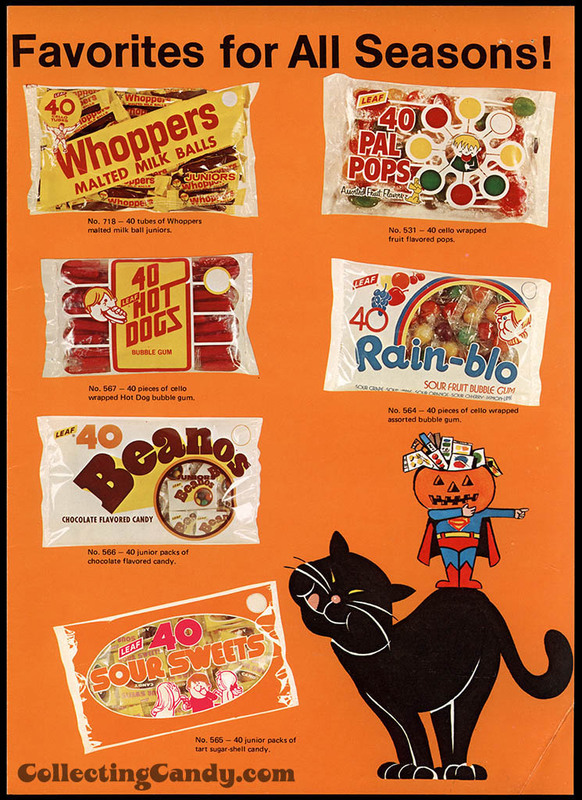 You’ll note that none of these feature Halloween-specific packaging. I’m not sure why that might have been, as seasonal-specific packaging design was a practice used at the time. Perhaps they sought to avoid selling product to their retailers that would lose its appeal on November 1st. Note how the unlicensed Superman-costumed kid becomes some strange candy-filled headless horseman character for this final page of the brochure. Spooky stuff! 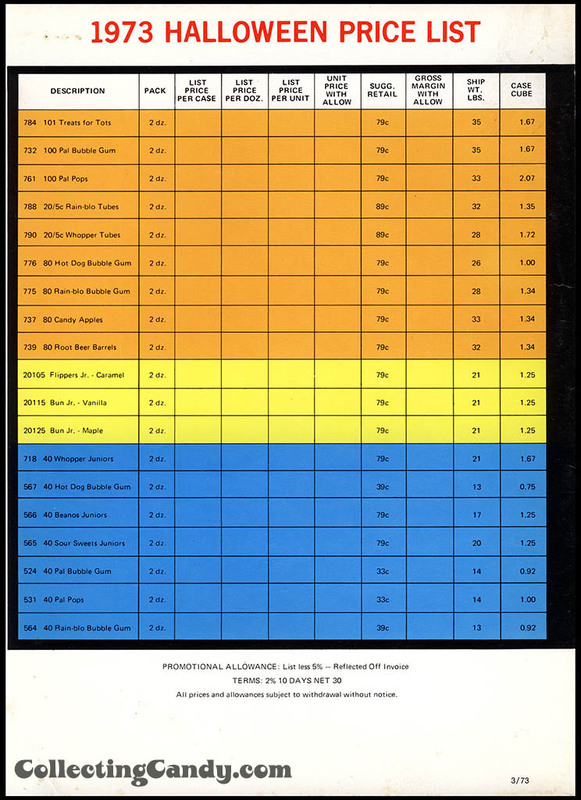 I think this 1973 Leaf brochure is pretty remarkable material, especially when you realize that the images it contains might be the only evidence that these products ever existed. And that’s everything I’ve got to share on this amazing Leaf 1973 Halloween brochure. See you next time! 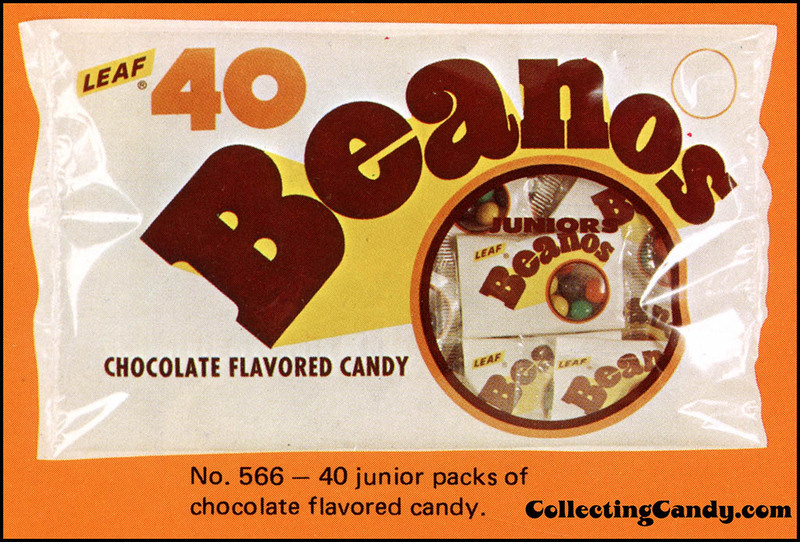 This entry was posted in 1970's, Bubble Gum, Chocolate, CountdownToHalloween, Gum, Halloween, Sour Candy and tagged 1970's, 1970's candy, 1970's Halloween, 70's, candy collecting, candy collection, candy collector, candy wrapper collection, candy wrapper collector, collectible, collecting candy, confectionery, confections, Halloween, Leaf, Leaf Brands, packaging, packaging design, salesman, seasonal, sweets, vintage candy wrappers, wrapper. Bookmark the permalink. 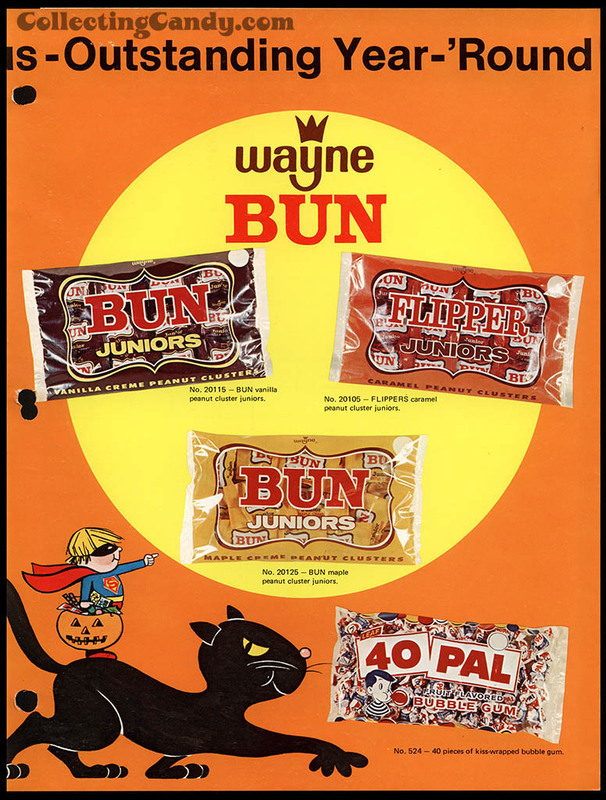 4 Responses to Flashback with Leaf’s 1973 Halloween Candy Sales Brochure! Those good old days are gone forever. 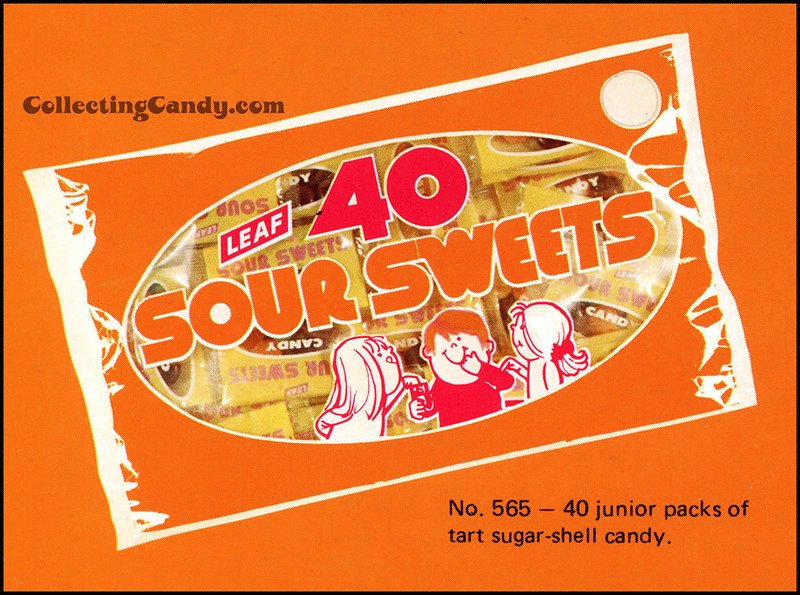 I enjoyed the Halloween candy article but the only Leaf products that I enjoyed were the soft candies. Didn’t care for hard candy. Prices were very good, too. Super fab! I love the hot dog gum package – but they’re all great. Thanks for posting these old brochures. I love them! Wow! 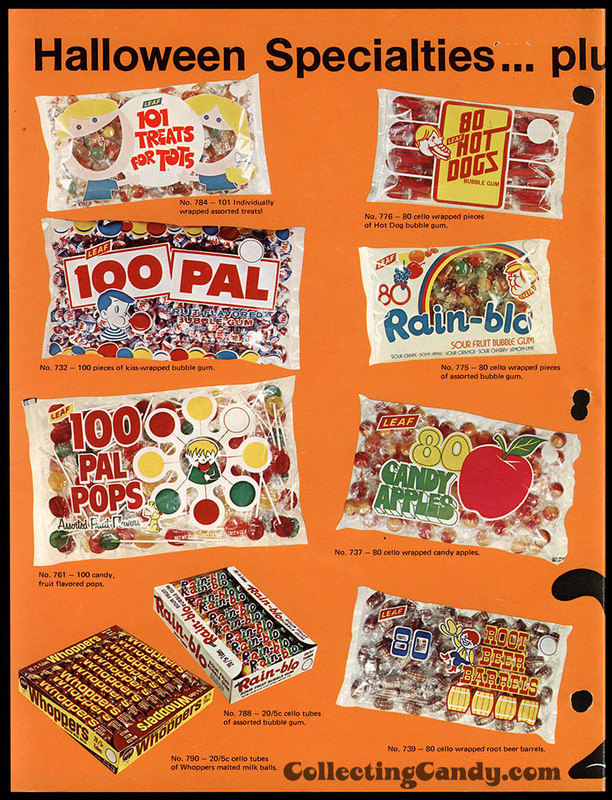 What a bunch of great candy and gum packaging photos. 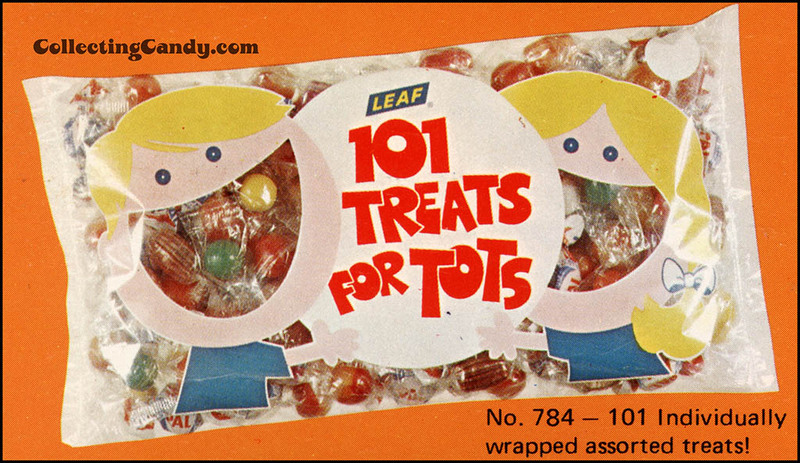 I love Leaf products from the early 70’s! Thanks for unearthing these gems!